Borkul the Beast is an Orc warrior who is found inside Cidhna Mine. 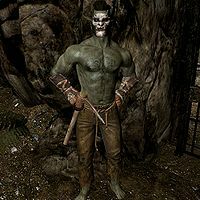 He is considered to be the toughest prisoner in the mine and guards the door leading to Forsworn leader Madanach. During No One Escapes Cidhna Mine, you need to convince him to let you pass in order to gain your freedom. He is only armed with a pickaxe and wears ragged trousers and a pair of iron gauntlets. When first encountered, he will not leave his spot near the door, though he is quite talkative. When you approach him he will say "The new meat. So soft. Tender." and ask you his initiation question: "What was it like killing your first one, huh?" Talk to him and you will be able to answer his question, from three different options. Telling him that the first kill was exciting will make him respond "A true killer, like me. The gods put us here to fill their halls with souls. You'll fit in fine down here." If you say you felt terrible he will be patronizing: "Pah. The gods have a place for killers. You can't carry the burden? You're weak." If you say you never murdered anyone, he will respond with a simple "Liar." You will then get the option to ask him a few simple questions. When asked what he is in for he will explain: "Murder. Banditry. Assault. Theft. And lollygagging." He will also tell you how much time he's done: "Guards brought me in about 12 years ago. Was running a good group of bandits up until then. But these Forsworn. They're nothing like the men I cobbled together. They're real killers." This conversation will also unlock some new greeting when he sees you: "You serve your time by digging. So dig." and "Prison's not so bad. Less complaints when I kill people." NOTE: Please see the related quest page or the shiv page for information on how to get the dialogue. Madanach is expecting me. (Persuade) Passed: "Hmph. Fine. Go on in. But don't try anything in there. Madanach knows more than you think." Let me through, pig-face. (Intimidate) Passed: "Those eyes. All right, killer, go on through. But don't try anything. Madanach knows more than you think." Victory: "It's been so long since I tasted my own blood. Sour." "Yeah, yeah. Go on in." After he lets you in, he will wait by the door until you prove your loyalty to the King in Rags. When you follow Madanach out to the main chamber, Borkul will stand in the crowd and listen to the speech and shout "The Reach belongs to the Forsworn!" along with the others. He will then run through the secret tunnel with the rest of the Forsworn and enter Markarth Ruins, saying nothing except "Get going" until you finally reach the City of Stone itself. Once outside, he will don a full set of Forsworn Armor and fight for his freedom like everyone else, battling his way through the city towards the gates. Once outside the city, he will run all the way to Druadach Redoubt where he will start his life anew as part of the Forsworn. He will now spend his time either patrolling the path by the river, or wandering around inside the cave, occasionally eating, relaxing, or sleeping. His only dialogue at this point will be about him naming you as Blood-Kin to the Orcs. Borkul may stop fighting his way towards the city gates during his escape, instead standing and uttering threats to no one in particular. ? When you leave the city through the gates, he will exit the city soon after and run to Druadach Redoubt. When you try to brawl with Borkul, he may equip his pickaxe during the fight. ?